Every diamond is unique but not all diamonds are created equal. One of the major factors in diamond choice is the amount of sparkle it has and whilst they all may seem to glisten in the light equally, there can be huge differences in the actual amount of fire, brilliance and illumination each one has. Making such an important and valuable purchase means taking every piece of information into consideration and whilst how the diamond looks in the store or online is an important aspect, the reality may not be as it seems to the naked eye depending on the way the diamond is displayed. Online images can easily be manipulated; increased or reduced in size to fit the website needs or ‘edited’ to appear very different to real life. When buying a diamond from a distance, it’s vital to know how it will actually look as accurately as possible. Diamond imaging is part of the solution to give consistency and a true to life image of the piece. Diamond imaging means taking the diamond from its background and photographing within a template. This gives a more consistent viewing experience. It can also highlight specific features or areas such as inclusions which is then accompanied by information as to whether these inclusions can be seen by the naked eye. One particular area where diamond imaging is important to customers is when they are looking at Hearts and Arrows cut diamonds. The imaging will clearly show the facets and the symmetry with the arrows showing as dark areas to increase their clarity within the diamond. A 360° video in HD is the closest online experience you can have to seeing a diamond in real life. It’s a new way to showcase the gemstone and brings it to life as opposed to static images. It’s not a method to be seen as a replacement to other information gathering tools such as an ASET Map but can be used as additional information. Video imaging gives the buyer the opportunity to see how the light plays with the diamond and the resulting white and colored flashes of light. Using a light box, it gives the most realistic display possible when filmed with a combination of diffused and directional light. An Ideal Scope is a specialist instrument used in the diamond industry to give visual information regarding how the stone handles light. The images show the diamond in a variety of shades of red with any white areas indicating light leakage and black being the camera lens reflection acting as the obstruction of light of the viewer’s head. The Ideal Scope creates a structured light environment in which to view a diamond to check for any deformities in the way in which light bounces off the walls and also gives an excellent view of the symmetry of the diamond. What we try to achieve with the finest cut diamonds is a true symmetrical pattern and a proportionate diamond. When looking through an Ideal Scope, the finest cut diamonds will have plenty of red light with clearly defined and evenly spaced black arrows with a minimal amount of white, gray or lighter areas with the basis being on a symmetrical pattern throughout. In contrast, a poorly cut diamond will show higher areas of white and gray, they will have a chaotic pattern and will have poorly defined arrows and areas of pink. This video by the inventor of the Ideal Scope shows exactly what this clever device can do. The Hearts and Arrows optical grading system works upon looking at the heart and arrow symmetry that a diamond has. An ideal diamond has 8 symmetrical and evenly spaced hearts which are uniform in size and shape and evenly split from one another with the arrows following the same trend. The hearts are then measured to give a true and accurate reading to ensure that they make the hearts grade. Any deformities in a hearts structure, spacing and uniformity or a measurement of the cleft which is over 8% of the total length of the heart will deem the diamond unacceptable to be graded as a True Heart. Arrows are measured in a similar way. Each arrow must have a clearly defined shaft and arrow head, uniformly separated from one another and with equal spacing away from the heart. Each arrow must be balanced, straight and have clearly defined edges otherwise it cannot be graded. 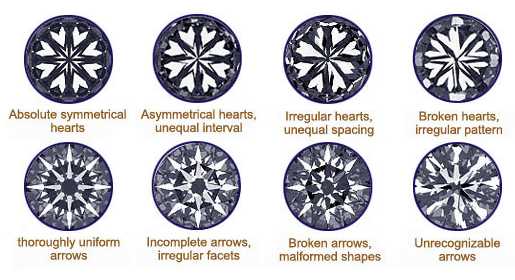 The Hearts and Arrows optical grading system was first presented in 2004 by Whiteflash, with the hope that every diamond laboratory would follow suit to allow for true and factual grading of the optical balance of a diamond. Unfortunately some laboratories still do not use this high standard classification, however companies like James Allen with True Hearts and Blue Nile with their Signature Round Cut Diamonds offer similar alternatives. The fact Whiteflash, Blue Nile and James Allen offer these grades mean that the diamond you are buying is one which has been graded to the very highest standard with as near perfect symmetry as you can get. What is an ASET Map? An Angle Spectrum Evaluation Tool (ASET) Map evaluates the light performance of a diamond. An ASET Map is vital to determine the sparkle of any diamond but is particularly useful for fancy shaped stones as the report gives the measurements and light performance of not only every facet but the most detailed data of every axis and meeting point of each face. When you look at a diamond yourself, it’s not possible to get a true idea of the sparkle and use of light in the diamond. Your head will block some of the light and there’s every chance the lighting environment won’t be perfect. The report mimics you looking at the stone from above but without the light interference of poor lighting, your head or other objects. What does the ASET show me? The results of an ASET Map can be very revealing. Two stones next to each other; one which is a really ideal cut and one which is of lower quality will probably look as if they sparkle as much as each other. However, the superior stone will use more light in the 45°-75° range and when taken out of artificial lighting it will still sparkle as much whereas the other diamond will not. This angle range is the most desirable to see on a report as it is the light which reflects the brightest. The more red shown on the report image, the brighter the diamond actually is. Areas which show as green are not as bright but are not a huge issue as they provide contrast within the stone. Blue sections indicate obstructions of light and again serve as contrast to the brighter areas. Is Video and Diamond Imaging issued as standard? 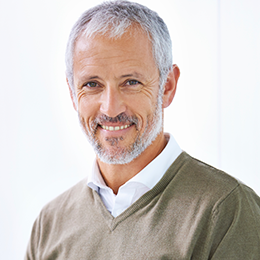 There are only a small number of specialist diamond jewelers who will provide an ASET report as standard; Whiteflash is one example and in addition they also freely offer Ideal Scopes, standardised diamond imaging and HD videos – the complete Diamond Image Package. Other companies however are more coy; some such as James Allen will provide one if you make a special request and they also offer videos but not Ideal Scope, but many other companies don’t make ASET information available at all. If this is the case, you really need to consider why they don’t want to share the information about the actual composition of the diamond. Some stores have LED lighting installed which is designed to produce illumination in a way which gives a false impression of the true nature of the diamond. An ASET Map will show you the truth and in addition, so will a Sarin report. Choosing a diamond is purely personal; the cut, how it will look when set in a ring and the overall quality report are aspects which will point to the final decision. However, it’s worth delving deeper to analyze the make-up of the polished stone as the excitement of the experience could be marred if the diamond looks very different in the light after purchase because of the way it was originally displayed. Take the time to carry out research, talk to specialist jewelers who are happy to pro-actively provide comprehensive image reports and videos like Whiteflash or James Allen and you’ll know that when you buy a diamond you own a piece which looks beautiful in any surroundings.